Don't we all wait for Summer just for one reason? Mangoes, mangoes and more mangoes. At least I always wait for Summer to devour many yummy fruits available during Summer like Watermelon, Litchi and especially Mangoes. Actually I live on fruits and chilled desserts on most of the Summer as I totally loose appetite for any non-veg. items like fish, egg or Chicken. So, whole summer season, I prepare something with juicy, ripe mangoes and I have also posted many recipes on the blog. 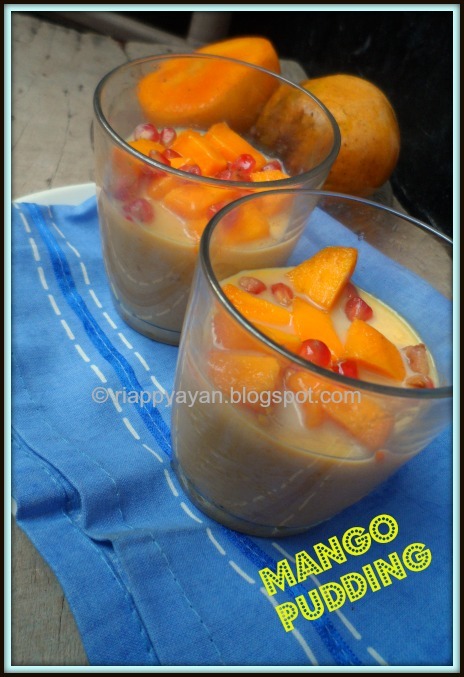 You can check all the mango recipes I have posted so far compiled in one page. 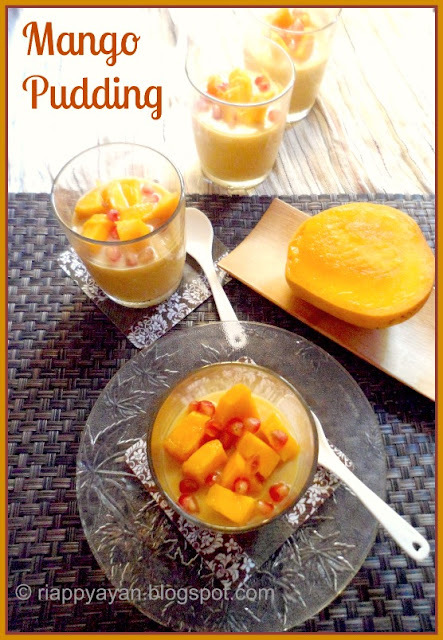 This mango pudding is one of those which I prepare frequently in Summer season but have not posted yet on the blog. 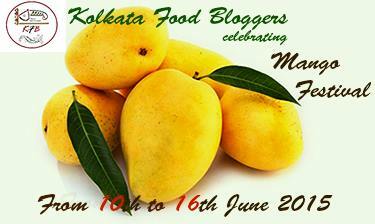 So, I got a fair chance to post this recipe, when Kolkata Food Bloggers have announced their Mango Festival this week. This recipe is very simple and no gelatin is added, usually I avoid to use gelatin in my dessert. I always make my Mango Pudding this way. It may take little longer time to prepare but taste really yummy. 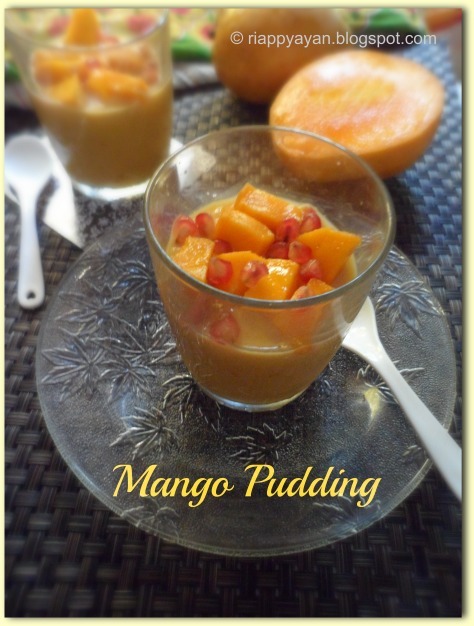 My kids who don't love to eat mangoes raw, love this dessert to the core. Chop mangoes, keep few mango slices for garnishing, take rest in a blender, add milk, condensed milk and eggs in the blender and make a smooth, lump-free mixture. Now pour the mixture into a heavy bottomed pan and in medium flame, let it boil and reduce to a thicker consistency with continuous stirring. Do not forget to stir for a single moment. If you are not using condensed milk, then substitute with sugar. Do not add all at once, add little by time checking the sweetness of mangoes first. You can use little cornstarch mixing with a little warm milk to fasten the speed of reducing the milk. Add vanilla essence lastly and stir to mix well. When the mixture has thickened and reduced to almost half, remove the pan from heat and let it cool. Then pour the mixture into serving bowls or glasses and chill in refrigerator until set. For best results, chill them overnight. Before serving, add freshly cut fruit pieces on top and serve. Note :: To be honest, It won't set as firm as a pudding made with gelatin, but overnight chilling gives an excellent result.